Garth: You were at Woodstock? Wayne: Excellent! What was it like? If Wayne's World is the shining example of a worthwhile movie based on a Saturday Night Live sketch, then Wayne's World 2 reasserts the status quo. Much wackier and much less funny that the first one, it repeats the same plot, layers on the familiar catch phrases, and loses all the magic. 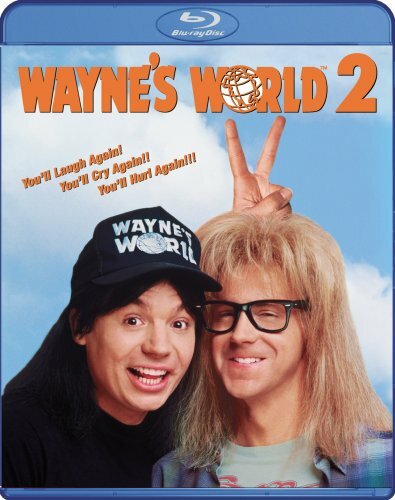 A lot has changed for Wayne (Mike Meyers) and Garth (Dana Carvey) since their first movie. For example, they now broadcast their mildly successful cable access show from a set in a warehouse loft made up to look like Wayne's mom's basement, instead of actually from Wayne's mom's basement. Hmm. I guess that's about it. Concluding that he has achieved all of his dreams—including landing rising rockstar girlfriend Cassandra (Tia Carrere)—Wayne seeks direction, and finds it in a dream. A weird, naked Indian leads him into the desert to meet Jim Morrison, who tells Wayne to put on a concert with all of his favorite bands ("If you book them, they will come," he notes). "Let's put on a show!" meets "love triangle" as Cassandra's band is courted by a slimy record producer (Christopher Walken), triggering Wayne's jealously and your memory of the plot of Wayne's World. In his talk-to-the-camera monologues, Wayne likes to point out the movieness of many scenes (confronted with a group of guys whose only job is to stack watermelons and crates of chickens and cross the street carrying a plate glass window, he wonders if it's going to pay off later on), but he's silent on the fact that they basically just remade the first movie. Meanwhile, Garth gets the short shrift with a pair of lame romance subplots, including one involving Kim Basinger as a voluptuous femme fatale that's so lame the script doesn't even bother resolving it. I admit it's silly to talk much about the plot, because a movie like this is only as good as its laughs, but there aren't many of those, either. Meyers' mugging and catchphrases are tiresome, and director Stephen Surjik, a Kids in the Hall veteran, favors sketch-comedy weirdness that tries too hard to be funny, including a kung-fu duel between Wayne and Cassandra's father that goes on a lot longer than a bad dubbing parody warrants. I did enjoy concert promoter Del Preston (Ralph Brown), a lifelong roadie who likes to tell rambling, obviously untrue stories about his days on the road ("So there I am, in Sri Lanka, formerly Ceylon, at about 3 o'clock in the morning, looking for one thousand brown M&Ms to fill a brandy glass, or Ozzy wouldn't go on stage that night. "), but the title character can't really support a second movie. It's a lesson Meyers failed to heed through two increasingly desperate Austin Powers sequels. The DVD: Like its predecessor, the Wayne's World 2 Blu-ray offers improvements to the DVD release, but doesn't quite justify the upgrade. The video quality for the higher-budget sequel isn't actually as impressive as the first film's; detail is good but the image lacks depth and colors appear a tad dim. The 5.1 TrueHD audio track is more satisfying, filling out the mix with a lot of surround action during the musical and dream sequences. The disc repeats the Paramount pattern on the extras front, carrying over the director's commentary and interviews from the DVD. And once again they've dropped the quirky interactive menus in favor of plan images from the terribly photoshopped cover art.